Our passion is to empower and prepare young adults by providing opportunities to explore different career paths, establish networks, and create an edge for future college and professional careers through our committed volunteers, mentors, and donors. 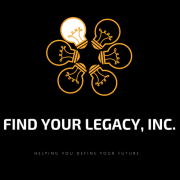 Find Your Legacy launched this past January 2018. We connect high school students with college mentors in their desired majors online through our website, findyourlegacync.com. We partner with local high school and surrounding universities and colleges in the Charlotte area to implement our program. Would you recommend FIND YOUR LEGACY INC?